Guitar Concerto No. 5 "Helsinki"
Timo Korhonen, dedicatee of the concerto, is resourceful, with a magisterial technique, and here wedded to Brouwer's stylistic manner. The recording is up to Ondine's usual high standards. The performances from soloist and orchestra are consistently splendid, and the recording quality is outstanding. Timo Korhonen is a superb guitarist who takes everything in his clean-fingered stride. The Tampere Philharmonic Orchestra shares his zest, the recording is first-class. I doubt that there's a better played, better recorded, more musically varied and appealing guitar and orchestra disc in the catalog. Magnificent! 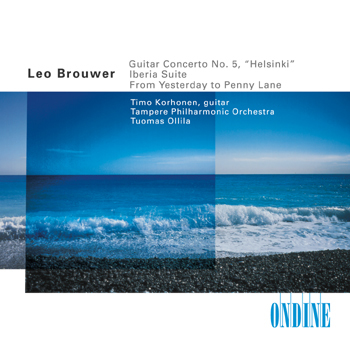 This CD features Finnish guitarist Timo Korhonen with Leo Brouwer's "Helsinki" Concerto, which the Cuban composer wrote in 1991-92 on commission from the Helsinki Festival. The work is dedicated to Timo Korhonen, who is here accompanied by the Tampere Philharmonic Orchestra under the direction of Tuomas Ollila-Hannikainen. This recording further contains two transcriptions by Brouwer: of Albeniz's Iberia Suite and of seven Beatles tunes. This CD won a Cannes Classical Award in 2003, in the category 'Solo with Orchestra'.